Learn about rockets, make a rocket, launch a rocket! The Rocket-Moon Shot workshop is an introduction to the exciting world of rockets and space flight for ages 5 to adult. 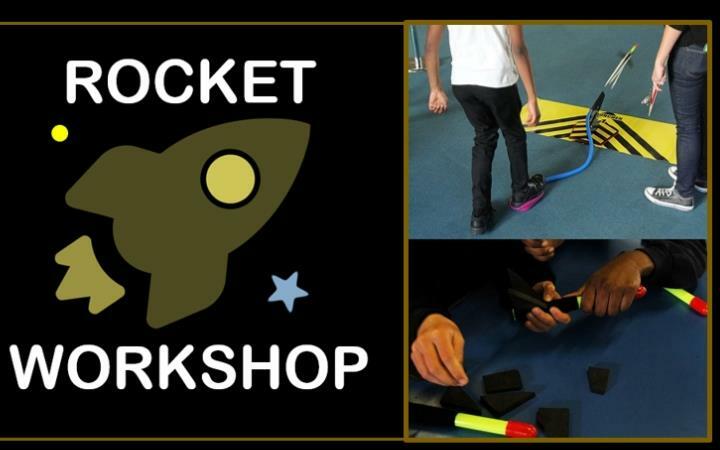 The workshop uses safe air-powered 'stomp-rockets' to teach the basics of how rockets fly and challenge children to apply the scientific method of testing, modifying and re-testing their rocket designs to try and land as close as they can to the marked landing point on our massive vinyl moon. This exciting and practical workshop gives a wealth of knowledge to the children covering key science subjects such as: forces, aerodynamics, flight, space/science history and teamwork. £5 per child/adult - supervising parents free, participating parents £5. This is an externally created and staffed workshop so, with our apologies, not included in the Heritage Ticket.